The Social Democrats received 21.2 percent of support in Yle's monthly poll, making them the most popular political party in Finland. In a fresh poll, Finland's biggest opposition party the Social Democrats saw support for their party increase by almost a full percentage point last month. According to the latest Yle poll, the SDP has the backing of 21.2 percent of the country. "You could now say that the SDP is Finland's most popular political party. The growth is largely attributed to its base, as their popularity among the working class population has grown," says Tuomo Turja, a research director with the Finnish polling firm, Taloustutkimus. 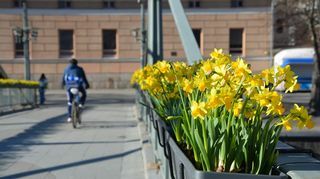 One year ago, Finland's Social Democrats were polling at only 15.6 percent in the political party support survey, and many were wondering how long party chair Antti Rinne would be able to hold on to his position. Turja says the latest survey results show the SDP is picking up voters from the Greens, Left Alliance and the Finns Party. "The increase in SDP support could be a matter of choosing to back a winning horse. The SDP is the opposition's largest party, and so it's easy to think that they're worth voting for," he says. Combined support for the three centre-right government coalition parties – the Centre Party, the National Coalition Party (NCP) and Blue Reform – is at 38.4 percent, according to the July poll results. No significant changes were noted in NCP support, but Prime Minister Juha Sipilä's Centre Party picked up 1.2 percent more support. "Center Party support has bumped up back to the same level it was at in May. Older people have come out in support of the party," says Turja. The situation is not looking bright for the Blue Reform party – the splinter group that broke off from the populist Finns Party in June 2017 after convicted hate speech offender and MEP Jussi Halla-aho was elected the Finns Party chair. Yle's latest poll suggests that support for the Blues is less than one percent. Party activists are eagerly awaiting a decision from high-profile Finns Party founder and Blue Reform defector MP Timo Soini. If he chooses to run again, his vote haul alone could keep the whole party afloat. Former parliamentary speaker and MP Maria Lohela's decision last week to not run in next year's parliamentary elections was a tough blow to the struggling party. 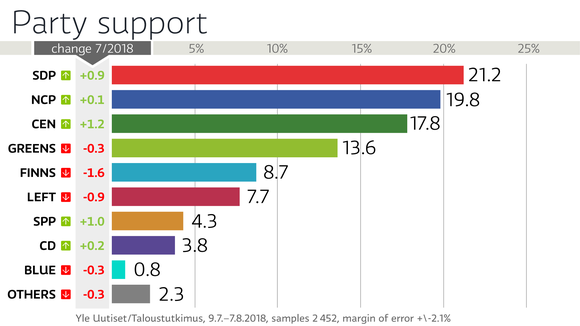 The poll suggests that Finns Party support has fallen by 1.6 percent since June, putting it back where it was one year ago. Green support is also down by 0.3 percent. Taloustutkimus interviewed 2,452 people between July 9 and August 8 for the latest poll. Some 1,501 of the respondents revealed their party preference, leading to a result with a 2.1 margin of error in either direction.